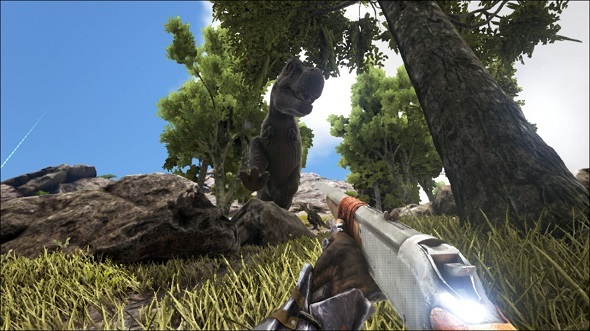 Long answer: when ARK: Survival Evolved launched as a Steam Early Access title on 2 June 2015, it did so with no publisher backing to help the unknown Studio Wildcard publicise their game. Four months later, still operating independently, it’s the fifth most played game on Steam, attracting higher daily player counts than GTA V and Metal Gear Solid V: The Phantom Pain. 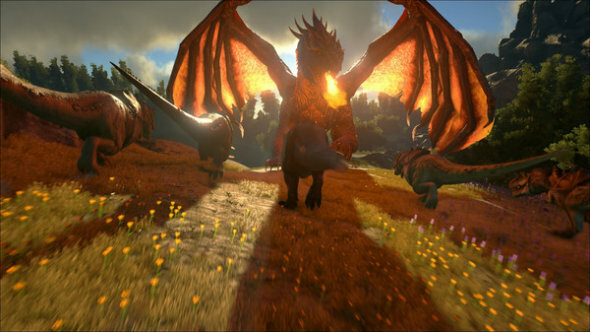 Prehistoric mounts, as alluring as they are, will only get you so far up that ladder – so I sat down with studio co-founder Jesse Rapczak to discuss the other factors behind ARK’s meteoric rise to prominence. 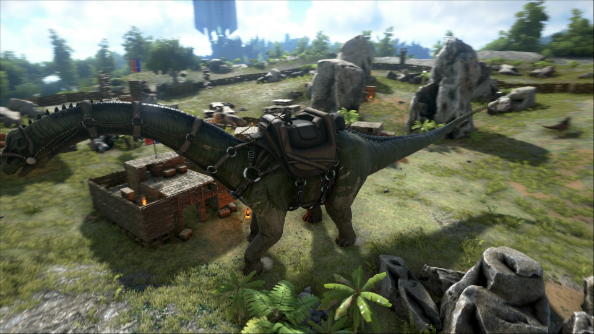 Want to customise your dino survival experience? Check out our best ARK mods. “To get the game off the ground,” Rapczak tells me, “it was pretty much self-funded. Private loans, stuff like that.” That’s a huge risk for any game developer, but in ARK’s case it was a risk moderated by a significant amount of triple-A game development expertise gathered at Studio Wildcard’s Seattle headquarters. Rapczak himself is a veteran of Microsoft Game Studios, where he worked on the augmented reality Hololens project, and Sony Online Entertainment. Working with him are veterans of the Uncharted and Primal Carnage games, across four studios worldwide: Instinct Games, based in Egypt and tasked primarily with engineering work, Efecto Studios in Colombia working on art assets, technical art and level design, Virtual Basement owned by Primal Carnage’s Ashton Anderson, producing the dino models, and Studio Wildcard itself. “Since then we’ve had to expand and spend more resources, but it’s all good because we have revenue coming in.” A lot of revenue. 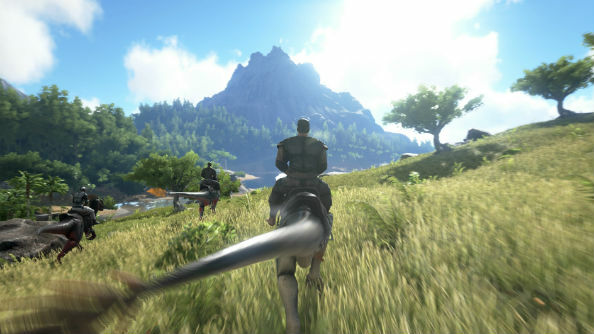 Rapczak estimates that the seven months of development prior to ARK launching in June cost $1.5 million – by contrast, it generated $10 million in its first week of release as an Early Access title. Four months down the line, that revenue stream has “allowed us to expand in the way we want and stop bootstrapping, and for lack of a better term, working out of our basements.” Ashton Anderson’s Virtual Basement proving the exception to the rule. ARK is currently the only UnrealEngine title with official mod support except Epic’s own IPs, and that unique positioning has attracted many semi-pro and professional developers to the game’s modding scene. The results vary hugely in theme and scale – baby dinosaurs, an advanced roofing system, and enormous new maps to explore and cultivate – but the level of quality seldom dips below the hugely accomplished. “The only way we can really do that is with our team, and the way we have everything distributed across all of our disciplines.” Colombia worries about its share of the plate-spinning, Egypt performs its own balancing act, and the remarkably swift development pace that has thus far characterised ARK continues. Rapczak is happy to bring up the missteps developers often make in Early Access, of course, because they can’t be squarely aimed at ARK – at least, not yet. Studio Wildcard could never be accused of going dark on its user base, nor letting their game fester as promised updates remain perpetually on the horizon. It’s an especially salient topic given the amount of money Studio Wildcard have made in such a short time, drawing parallels with DayZ standalone, released via Ealy Access in 2013 and still awaiting a final build. The definitive judgement will come on v1.0 release day in June 2016, but thus far ARK is setting a fine example to other Early Access titles. What are Studio Wildcard doing differently to avoid those pitfalls, I ask? So, the dinosaurs have undoubtedly helped. Likewise the modding scene, and the proactive approach Studio Wildcard have taken to turning player feedback into game updates with unnerving speed. 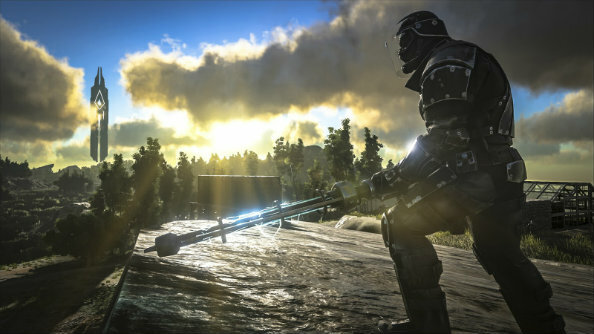 But as with so many Early Access titles – and, indeed, so many survival games, Twitch and YouTube streamers are also major players in the story of ARK’s success. The list of broadcasters who played the game prior to launch is formidable, and they provided a very effective grass roots PR campaign for Studio Wildcard. “We definitely leveraged Twitch a lot. 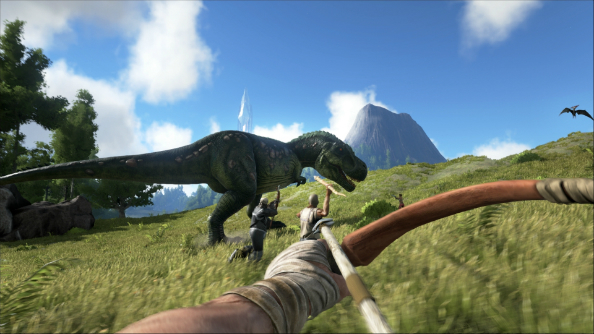 It’s important to reach out and get people playing the game… it’s given our game not just street cred, in terms of gameplay, but it’s always kept it somewhat high profile on people’s radars.” Streamers with small audiences prior to ARK’s release have since gained large followings off the back of their dinosaur-hunting broadcasts, he tells me. It’s a point that Rapczak labours throughout our chat, but if you’re going to stress any one aspect of Early Access development, it’s going to be that. ARK may have taken a completely different direction, thematically and mechanically, without the input of its 30-60,000 daily players. With them, it’s become, simultaneously, an adventure game, a sandbox, a mod haven, a developer’s portfolio, and perhaps most pertinently, a good news story amidst a slew of games whose wheels fell off the wagon during Early Access. There’s a growing sense within the ARK community that this is game development done right, and as you look back on ARK’s story thus far you can’t help but wonder if triple-A developers wouldn’t benefit from stealing a few of Studio Wildcard’s practices, emphasising a breadth of ideas and mechanics over launch day polish. That argument, of course, only holds up as long as ARK does one day arrive at the same level of polish as those aforementioned triple-A titles. By final release next June though, ARK will already have well and truly made its impact on the industry.